The primary indication for the existence of discrete energy levels came from the study of the spectrum of emissions of energetically excited atomic systems. Historically, the most important such spectrum is that of the simplest atom, hydrogen, a system of one proton and one electron bound together by their electromagnetic attraction. Within the framework of classical physics, the structure of the hydrogen atom poses fundamental problems. The first is the existence of a stable ground state: An electron in orbit around a proton is in constant acceleration, and therefore, according to Maxwell's classical electromagnetic theory, should continuously radiate away energy. Furthermore, the radiation emitted as the atom decays to a lower energy state should form a continuous spectrum of frequencies. However, the hydrogen atom both possesses a stable ground state and emits radiation at only a discrete set of frequencies. The quantization of the allowed energy values that occurs in quantum mechanics has analogs for other physical quantities as well, such as angular momentum. The basic reason why such quantization occurs for bound systems of particles in quantum mechanics but not in classical mechanics is that in quantum mechanics particles have associated wavelike attributes, specifically a wave function which encodes the dynamical state of the particle. (This is the content of wave-particle duality.) The wave function of a bound state satisfies an equation similar in many ways to the equation describing waves on a guitar string or drumhead of finite extent. Such musical instruments produce only certain specific notes, or frequencies, for a given length of string or size of drumhead. In other words, the frequencies are quantized. Similarly, the modes of oscillation of the wave function for a quantum system of finite extent are also quantized, leading to discrete energy levels, and so forth. An unbound quantum system, however, is analogous to a string of infinite length, which can play a continuous range of notes. Energy levels are of great importance for many systems other than simple atoms such as hydrogen. For instance, they determine the interactions and binding of molecules in chemistry and biochemistry, the stability or decay of nuclei, and the macroscopic properties of solids, such as the optical properties of dyes or semiconductors. The observed spectroscopy of the energy levels of a system can also elucidate the properties of a new force, just as the study of hydrogen led to the development of quantum mechanics and quantum field theory. One of a number of discrete energies that, according to quantum mechanics, is associated with an atomic or molecular system. For instance, a hydrogen atom, which consists of a proton and an orbiting electron, has an energy due to electrostatic interaction between the electron and proton and to the motion of the electron. This energy can only have certain fixed values, which correspond to different orbits of the electron, and these constitute the electronic energy levels of the atom. The state of lowest energy is the ground state of the atom and higher states (in which the electron is farther from the nucleus) are known as excited states. Neither the hydrogen atom nor any other type of atom can take up energy continuously but can only ‘jump’ from one energy state to another: the energy is said to be quantized. This behavior is quite general, applying to energies of vibration and rotation in molecules and to energy difference due to interaction of magnetic moments of the electrons. See also excitation; hydrogen spectrum. a possible value of the energy of a quantum system, that is, a system consisting of microparticles and obeying the laws of quantum mechanics. The mircoparticles may be electrons, protons, or other elementary particles, as well as atomic nuclei, atoms, or molecules. The intrinsic energy of quantum systems of bound microparticles—such as an atom, which consists of a nucleus and electrons bound by electrostatic forces, or an atomic nucleus, which consists of protons and neutrons bound by nuclear forces—is quantized; that is, it takes on only specific discrete values ℰ0, ℰ1, ℰ2, ...(ℰ0< ℰ1 < ℰ2,...) that correspond to stable, or stationary, states of the system. The states may be graphically represented, by analogy with the potential energy of a body raised to different levels or heights, in the form of an energy-level diagram (see Figure 1). A horizontal line drawn at a height ℰi(i = 0,1, 2, ...) corresponds to each energy value. The set of discrete energy levels of the quantum system in question forms the system’s discrete energy spectrum. be excited, that is, must acquire energy, to undergo a transition to these levels. Quantum transitions between energy levels are denoted in energy-level diagrams by vertical or slanted lines that connect the corresponding pairs of energy levels. Figure 1 shows radiative transitions with frequencies vik that satisfy the frequency condition hvjk = ℰi – ℰk, where h is Planck’s constant. Nonradiative transitions are often denoted by wavy lines. The direction of a transition is indicated by an arrow; an arrow pointing downward corresponds to the emission of a photon, and an arrow pointing in the opposite direction corresponds to the absorption of a photon with an energy of hvik. Discrete emission and absorption spectra correspond to a discrete energy spectrum (seeSPECTRUM. OPTICAL). For a quantum system that has a continuous energy spectrum in specific ranges of energy values, continuous sequences of energy levels in the corresponding ranges are obtained in the energy-level diagram. For example, such a continuous sequence of energy levels is obtained for the hydrogen atom at energies of ℰ > ℰx, where ℰx is the ionization limit (see Figure l.b in ATOM). 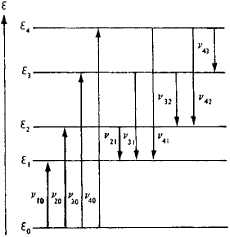 For an electron in a crystal, an alternation of allowed and forbidden energy bands is obtained (for example, see Figure 1 in DIELECTRICS). Radiative quantum transitions between discrete energy levels and energy levels belonging to a continuous sequence or between continuous sequences of energy levels yield continuous absorption spectra—for example, during the photoionization of atoms, which corresponds to a transition from discrete energy levels to continuous levels lying above the ionization limit—or continuous emission spectra—for example, during the recombination of ions and electrons, which corresponds to a transition from continuous to discrete energy levels. An important characteristic of energy levels is their breadths, which are associated with the lifetime of the quantum system in a given level. The longer the lifetime, the narrower the energy level, in accordance with the uncertainty relation for energy and time. When the energy levels of quantum systems are considered, the energy values are customarily reckoned from the ground state. In addition to an energy scale, which is usually calibrated in electron volts (eV) or, for atomic nuclei, in millions or thousands of electron volts, scales based on quantities that are proportional to energy are used in spectroscopy. Thus, a frequency scale (frequency v = ℰ/h) is used in radio spectroscopy, and a wave-number scale (wave number v/c = ℰ/hc, where c is the speed of light) is used in optical spectroscopy; 1 eV corresponds to a frequency of 2.4180 × 1014 hertz, or a wave number of 8,065.5 cm–1. In X-ray spectroscopy the rydberg (Ry) is used as the unit of energy; 1 Ry = 13.606 eV. In optical spectroscopy we often speak of the spectral term, which means the value of T = –ℰ/hc. For atoms, T is reckoned from the ionization limit and is given in cm–1. The kinetic energy supplied by waves or current action in an aqueous sedimentary environment either at the interface of deposition or several meters above. An allowed energy of a physical system; there may be several allowed states at one level. No influence of net energy levels of the experimental diets was observed on final body weight (P>0. The study also looked at how geomagnetic storms affect the belts, and when the researchers examined a broad range of energies, they found "consistencies in storm dynamics," says Reeves, who noted some common behavior in the electron response at different energy levels, even as the details varied. 2008) who performed the trial on ducks and evaluated the energy level which best fits for growth parameters of the ducks. It is important to stick to a sleep cycle and you would see your energy levels turn around for good," says Dr Byotra. For all moisture content except 25 (Percent) , the swell pressure increases with increase in compaction energy level. The non protein energy levels may also influence the dietary protein requirement of fish. Do we always provide our bodies with the proper raw materials they must have to survive, be healthy, provide us with the energy levels we desire, and maintain a healthy immune system? Einstein had pointed out that if a photon of a certain size struck a molecule, the molecule would absorb the photon and rise to a higher energy level. I don't think it's been a factor in anything other than just not having your normal energy level," he said. If the spins of nearby fermions point in the same direction, however, the particles can't share space or assume the same energy level in an atom. If you start walking or exercising regularly, your energy level will increase in a short amount of time. He tries to schedule lessons in the morning when his energy level is highest.